The European Cup, in it's current guise as the UEFA Champions League, in recent seasons has been dominated by the rich mega-clubs. The fact that Italian giants Juventus have become the 'plucky underdogs' that many neutrals are backing in the final stages of this years competition tells you all you need to know about the tournament in it's current form. Although big clubs like this years other semi-finalists Barcelona, Real Madrid and Bayern Munich have always done well in European competitions it was possible in days of yore for smaller sides to realistically dream of winning the biggest prizes in club football as well. Whereas the UEFA Europa League, formerly known as the UEFA Cup and before that the Inter-Cities Cup, and the UEFA Cup Winner's Cup was won by smaller sides such as Dinamo Tbilisi, Mechelen, Aberdeen and Ipswich Town to name but a few, even the European Cup itself saw some unlikely names engraved upon it. Clubs such as Nottingham Forest (twice), Feyenoord and Celtic had claimed the 'cup with the big ears' by the early 1980's, but even still the match up on May 7, 1986 between the Catalan giants Barcelona and Romania's Steaua Bucureşti looked on paper like a mismatch. Although it hadn't all been smooth sailing for the reigning La Liga champions, it was widely expected that they're potent attack would prove too much for Steaua. While Barcelona were more attack minded, a near impenetrable defense that had kept four clean sheets on the way to the final and had not conceded more than one goal in any match was what Steaua would rely on to defeat Terry Venable's side. In front of 70,000 spectators at Seville's Estadio Ramón Sánchez Pizjuán, the Romanian side kept Barcelona's stars, such as the mercurial Bernd Schuster at bay and kept the match scoreless through 120 minutes. As the shootout progressed, spectators were left wondering if anyone would find the net that night as all of the first four shots - two apiece - were saved by the respective keepers. Finally Steaua forward Marius Lăcătuş found a breakthrough when he smashed his side's third kick under the bar. 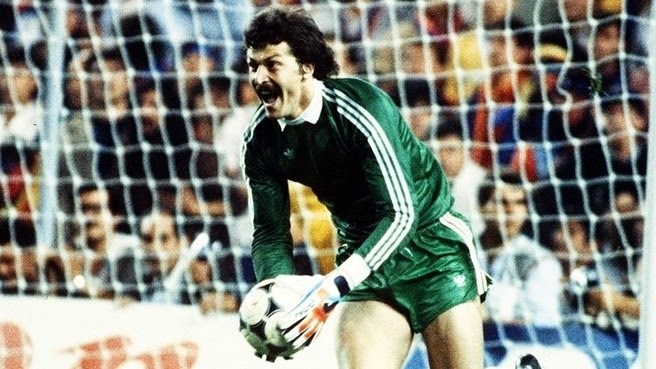 With his side now in the lead, Steaua's Helmuth Duckadam saved yet another Barcelona effort before Gavril Balint put the Romanian champions up 2-0. With Marcos Alonso Peña having to score to keep Barca's hopes alive, Duckadam, the later named 'Hero of Seville', saved to his left and landed his side a remarkable triumph on the back of his four penalty saves.